* Product should be stored in a flat, dry, the temperature suitable for less dust. * Do not put it in direct sunlight or near the heating device. * Do not put it near the stove or be susceptible to corrosion or water. * Do not disassemble the host privately. 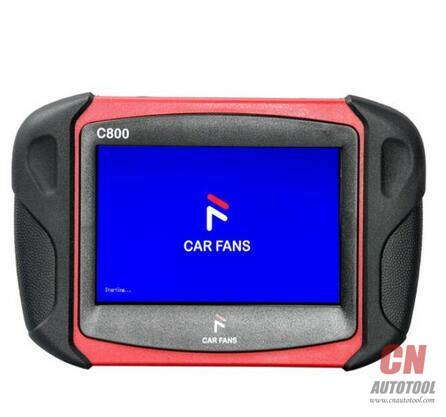 * If device not use for a long time, please run the CAR FANS C800 host regularly to avoid damp. * When making touch screen corrections, do not click on the touch screen when the cross cursor is not displayed. * Please do not put any foreign body on the touch screen, to avoid the pressure caused by the touch screen inaccurate and internal components damage. * Please do not expose the touch screen to direct sunlight or ultraviolet light to extend its service life. * Please do not place the product next to the electrical equipment that generates electromagnetic interference, so as not to affect the oscilloscope effect. cleaning agent or finger wipe touch screen. * Do not pull out SD card in the card reader during upgrade, otherwise it will lead to data loss. To properly unplug the SD card as follows: On the Windows desktop, open the “My Computer” window, right click on the “removable disk” in the pop-up menu bar select “pop” item, and then can pull out the SD card. 1. When purchasing the product, be sure to open the package check. If product need to repair after warranty, we will be appropriate to receive maintenance costs, freight borne by the user.